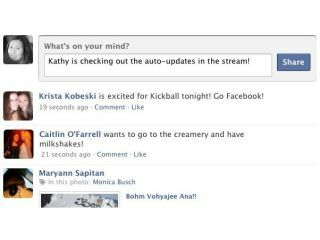 The bods at Facebook announced today another change to the website's homepage – an updated friends stream. Revealed on Facebook's official blog, the new feature means that instead of having to constantly refresh your homepage to see if someone has messaged you, the page will automatically update in real-time. "We've always focused the stream on real-time updates, but before today you needed to refresh your browser to see the most recent posts since logging in." explains the blog. "The stream now updates automatically and gives you the option to view new posts with a prompt at the top of the page immediately below the Publisher." As with all of Facebook's changes, not everyone will see immediate changes. There is a gradual roll-out of the new service, which is another shift towards turning the website into a Twitter-like 'immediate update' website. While the number of people on Facebook is around 200 million, Twitter has seen amazing growth over the past year. Recent statistics by Nielson show that Twitter has around 6 million unique users, but its growing at a faster rate (1,382 per cent) than any other social-networking site on the web.